The dark false mussel is a native mussel distinguished by the tooth-like projection on the inside of its shell. 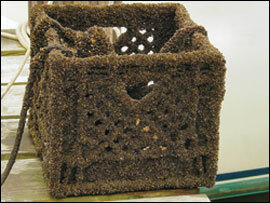 It can densely colonize pilings and other underwater surfaces and helps filter river water. Resident of the Magothy have noted particularly clear water in years in which it is abundant. Populations were high in the Magothy River in 2004 and 2005 (it was likely introduced by Hurricane Isabel), declined, and then reappeared in some creeks in 2014 and 2015. When clearing mussels off of equipment, particular care should be taken to ensure that the mussels are not eaten by dogs. Dogs have become ill and even died after consuming the mussels.